Transform your room into a space you absolutely love! I specialize in highly affordable and heartfelt home design. I pride myself in doing MORE with a far smaller budget than high-end designers. Simply email me at inspiredwhims@gmail.com and we'll get started today. Your home is going to look amazing!! Have a blank-canvas of a room that you'd like to decorate but you don't know where to start? Perhaps you found the perfect room in a magazine or online that you want to replicate, but at a fraction of the price? An inspiration board (also called a design board or mood board) is a custom design plan for your space. It consists of a visual layout of a variety of decor items - such as furniture, paint colors, fabrics, window treatments, lighting, accessories, etc. - that will infuse your room with style. This service is completely customized to your specific tastes, budget, and specifications. It includes a graphic showing all the decor items plus a detailed source list with pricing, so you can quickly find and order the pieces you select for your space. Already have a good grasp on what you want in your space, but you just can't seem to find that one perfect item? I'd love to help you find that key piece! Maybe you are stuck on finding an updated light fixture to hang over your dining room table or the perfect armchair to complement the sofa in your living room. Let me take the reigns and do the legwork and research for you. Have a room you want to hand over to me in-person and see it totally transformed? This service includes the hands-on planning and execution of completely decorating a room, from start to finish. First we'll discuss your vision for the space. I'll do my research, hunt for samples, create an inspiration board (see above service); then you'll pick what you like, I'll acquire the materials (i.e. paint, hardware, fixtures, etc. ), and make your dream room come to life. Want help you picking out paint colors? Need a personal shopper for decorating items? Perhaps you want help staging your house so it's ready for today's tough real estate market? Simply contact me with a specific service request and we'll make it happen. 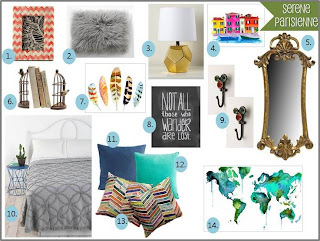 Can't seem to land a good nursery theme? Found something on Craig's list and want some suggestions on how to breathe new life into it? Don't know what type of window treatments would be best for your bedroom? Individual design and decorating questions are always free on Inspired Whims! I truly value hearing from my readers and I love nothing more than helping you out with your daily design dilemmas or helping point you in the right direction for decorating pieces. Please never hesitate to ask me a question - that's what blog friends are for! Please contact me at inspiredwhims@gmail.com for more details, service requests, or payment information. Looking forward to working with you! Thank you for the inspiration board! I love it! I'm getting my online shopping on right now. love< love< love the boards! stealing the dining room table idea> have any foyer ideas?